1935: Amelia Earheart flew from Honolulu to California nonstop. The first Major League Baseball game was played at night. The iconic game of Monopoly debuted, and a woman named Katie Herron was born. Today, Katie is one of Reach Kidney Care’s most inspiring patients. Since 2014, she has been attending a Middle Tennessee Reach Kidney Care clinic to learn more about kidney disease. In fact, since her first Reach visit, Katie has increased her kidney function by learning how to maintain her diet and lifestyle. On her first visit, she was intrigued. She admitted she was shocked by how much there was to learn about these small organs. Nobody had ever taken the opportunity to explain what exactly the numbers and figures on her medical charts meant. “The biggest benefit has been being able to come here and receive the education,” Katie said. Katie’s daughter, Pat, agreed. Pat said that Ed Dennis, the Reach Care Coordinator, clarified medical terminology and defined what specific terms meant in relation to her mother’s circumstances. Because of this new summary and understanding, Katie was motivated to focus on her health more. But to Katie, the encouragement provided by Reach was just as significant as the education. Reach is a place of support, to celebrate the improvements and progress each patient is making. The full comprehension and compassion she received made the possibilities for her future clear and attainable. She even acknowledged Reach helped eliminate some of the gloom associated with kidney disease. “Knowing this is something I don’t have to go through alone made me feel a lot more confident,” she said. She loves knowing Ed’s always “got her back.” And at the end of the day, that’s what Reach is here for. Reach aims to help patients avoid hospitalization and dialysis by providing an educational support system. 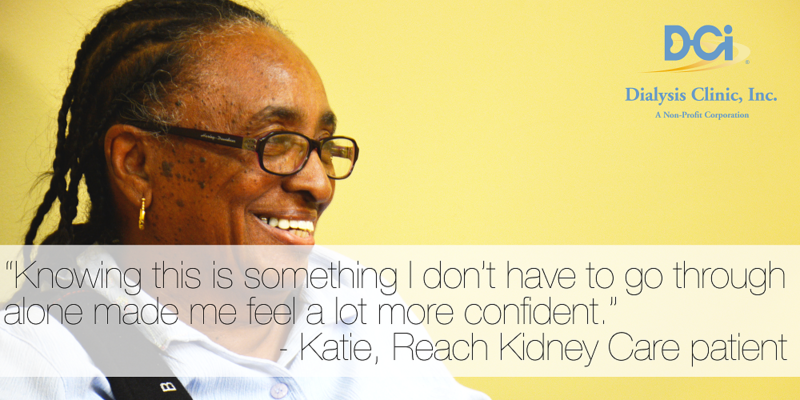 As Katie said, Reach exists to help patients in times of need or stress.